PT Bahana Pembinaan Usaha Indonesia (Persero) - Bahana PUI or known as Bahana Group is a well-established state owned financial and investment services company in Indonesia. Bahana Group has its business activities focused in four sectors: investment banking, securities trading and brokerage, venture capital, asset management and office Building management. PT Bahana Pembinaan Usaha Indonesia (Persero) is a non listed state-owned company and is 100% owned by the Government of Indonesia. 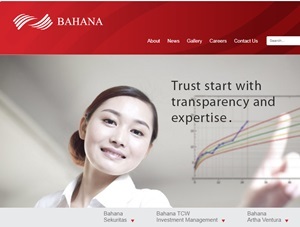 According to information found in Bahana Group's website as cited by JobsCDC.com, Bahana Group now has 5 subsidiary companies, namely PT Bahana Artha Ventura (99% owned by Bahana Group and engaged in venture capital), PT Bahana Securities (99% owned by Bahana Group and engaged in investment banking, securities trading brokerage), PT Bahana TCW Investment Management (60% owned by Bahana Group and engaged in asset management), PT Graha Tata Niaga (53% owned by Bahana Group and engaged in office building management), and PT Bahana Kapita Investa. Bahana Group is based in Jakarta and its head office is registered at Graha Niaga 18th floor - Jl Jendral Sudirman, Kav 58 Jakarta 12190. Minimum Bachelor’s Degree (S1), preferably majoring in Business, Management, Commerce, Economics, Finance, Marketing or equivalent. Required experience for minimum 3 years in corporate or commercial lending. Advanced knowledge in Private Equity is a plus. Outgoing personality, professional and attractive with good attitude. Fluent in English, both oral and written..
Proactive and high initiative, action oriented, and good team player. JobsCDC.com now available on android device. Download now on Google Play here. Please be aware of recruitment fraud. The entire stage of this selection process is free of charge. PT Bahana Kapital Investa - Private Investment Officer Bahana Group September 2018 will never ask for fees or upfront payments for any purposes during the recruitment process such as transportation and accommodation.